Advanced database converter application supports all major database data types, attributes, field names, key constraints, indexes, schemas, null values, primary key while converting database records from one format to another. MSSQL to MySQL database utility facilitates user to convert bulk database records created in Microsoft SQL db into MySQL server effectively and fast as compared to manual conversion process which is complex and expensive. ...... Database transformation application reconfigure original database structure into normalize form and has ability to work in both Windows and mixed authentication mode. 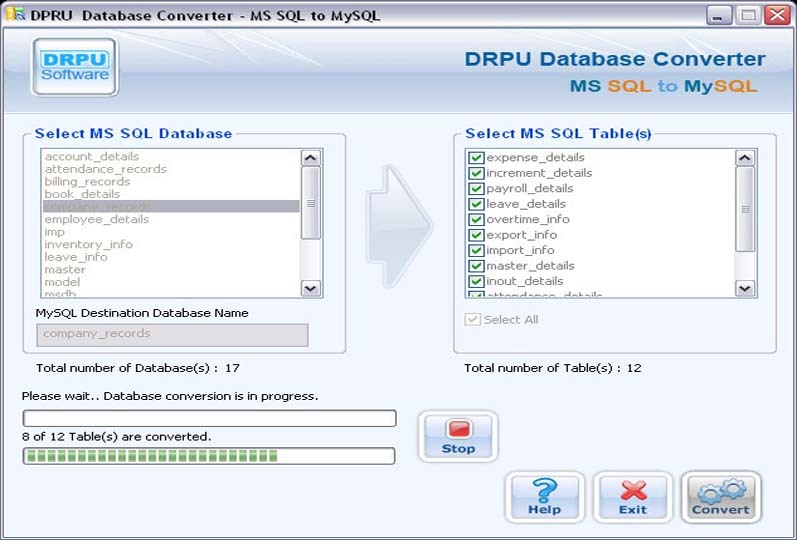 MSSQL to MySQL database converter utility facilitates user to overwrite/merge converted MSSQL database records with existing MySQL database records or creates new records and saves them at user specified location on hard disk for further reference. Database migration software provides both install/uninstall feature and efficiently runs with all major versions of Windows operating system including Windows 2000, 2003, NT, ME, XP, Vista and 7 successfully. MSSQL to MySQL database converter process provides user friendly GUI interface wizard which help user to easily access the functionality of the program with inbuilt user manual guide preview option and not require any special technical skill. Qweas is providing links to MSSQL to MySQL Database Converter Software 4.0.1.6 as a courtesy, and makes no representations regarding MSSQL to MySQL Database Converter Software or any other applications or any information related thereto. Any questions, complaints or claims regarding this application MSSQL to MySQL Database Converter Software 4.0.1.6 must be directed to the appropriate software vendor. You may click the publisher link of MSSQL to MySQL Database Converter Software on the top of this page to get more details about the vendor.